Inspired among others by Belgian classics such as Lambic, Gueuze and Rodenbach, and more recently by experimental American craft brewers, there is a barrel-aged and sour beer revolution underway. It won't be on everyone's radar - or to everyone's taste - but if you enjoy drinking something a bit different then it is definitely something to look into. 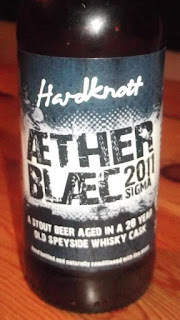 This example, from Cumbria's Hardknott Brewery which has been building itself an outstanding reputation for powerful, flavoursome ales, came to me as a very kind leaving gift when we were moving from London to northern Germany last month. Now we're mostly unpacked, I thought it was about time for something a bit different from the Pilsener, Weizen and Dunkel that pretty much sums up the local beer culture here. 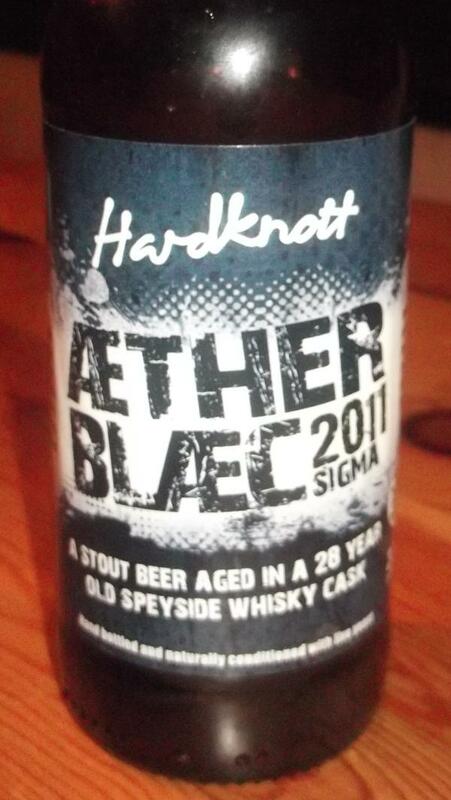 Listed as a 7.8% Imperial Stout, this particular batch of Æther Blæc spent six months maturing in a 1982 Inchgower malt whisky cask - I had bottle 520 of 540. The result is fascinating - a black beer with a coffee crema that's not sour as such, but it has a light fruity tartness on both the nose and in the mouth. Also on the nose are vanilla, peach, treacle toffee and wood, all of which are to be expected from the barrel. Then in the mouth there is an initial dry lemony tartness, followed by a touch of roast coffee and a sort of tart peach note with hints of strawberry and plain chocolate. Finally, the finish brings the treacle toffee and lemon flavours back, before sliding into an unusual dry smoky fruit character. Perhaps it’s not ’style’ for an Imperial Stout, but it’s delicious and fascinating stuff. Interestingly, for me it comes across more as sour than barrel-aged, although it's clear that the former derives from the latter. In contrast, many other barrel-aged beers, especially branded ones such as Innis & Gunn, are more about getting wood flavours into an otherwise regular (ie. non-sour!) beer. Perhaps tart beer won't be to your liking - but perhaps it will, if you give it a chance. Belgian Lambics already have a keen following, while in the US so many drinkers have acquired the taste that brewing giant Molson Coors has allocated a chunk of its giant facility in Golden, Colorado to producing sour and barrel-aged beers. Who knows, maybe its UK operation Sharp's, which is already doing Belgian-inspired Tripels & Quadrupels, might follow suit.